As soon as I saw the label for this beer I had to get it. 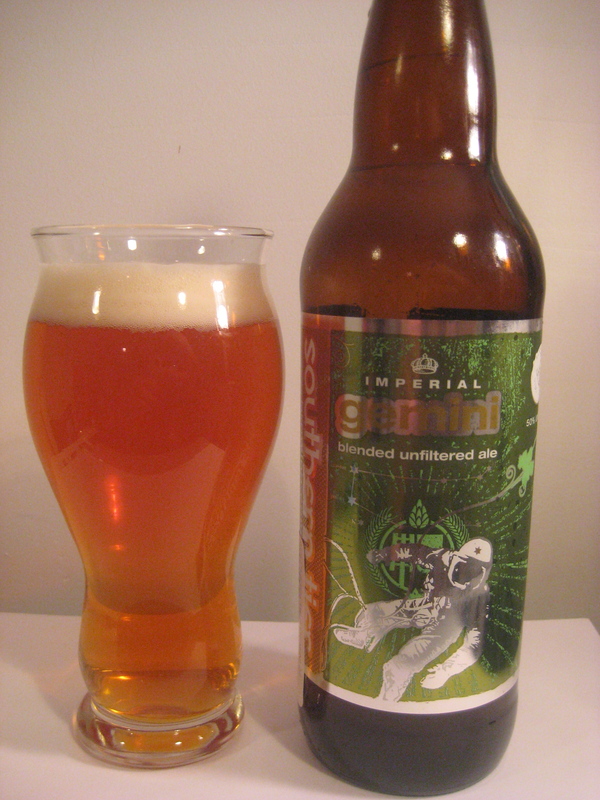 The Southern Tier Imperial Gemini Ale label boasted that it is dry hopped with Amarillo, Cascade, Centenial, Chinook, and Columbus hops. As a major hophead and a huge fan of the Amarillo hops, so I had to try out this beer. I can only imagine what the aroma will be; it should be amazing if the beer measures up to the ingredients. Give this beer a nice steady even pour; add a bit of distance at the end to build up the head. This will help open up the aroma. The Amarillo hops are quite evident; you can smell the hops are an arms length. The aroma is very floral and citrusy, very pleasing. But then again it should be with the amount of hops then have been dry hopped. A clear copper color with a moderate bit of carbonation. Beer had good head retention and nice lacing. This beer has a wonderful citrus and caramel flavors. The aroma with this beer really helped bring the taste of this beer to another level. There was also an pleasant little zing from the alcohol in the aftertaste. I would drink this every day. Great flavor, aroma, and definitely packs a punch at 10.5% abv. I think this is probably one of the best Imperial IPA’s I’ve had.